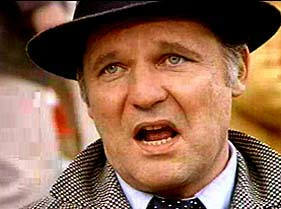 John Vernon (aka Animal House’s Dean Wormer) dead at 72. Well, sober, upstanding and dead don’t sound too good either. And do not forget, he also gave the world a really hot daughter — rest well, Mr. Vernon, you’ve earned it. Canadians remember him as Wojeck, crusading medical examiner that predated “Quincy” by 10 years. Personally, I remember him best as the mayor of San Francisco opposite Clint Eastwood in “Dirty Harry”. He’ll be missed by all. but being “fat, drunk and stupid” has worked so well for SEn. Kennedy hasn’t it? Let’s not forget he was also the mayor opposite Sledge Hammer in the pilot of Sledge Hammer! Or Mr. Carruthers in . One of the great heavy/bad guy character actors of the 70’s and 80’s. Wish I had a list of all the TV shows he did when I was a kid.